We live a little east of San Antonio. When hurricane Harvey’s winds were just a few hours out, I had a choice: bring in severely under ripe, astringent, Asian persimmons (and super green tomatoes) or risk breaking the brittle branches that were loaded with fruit and have the fruit split from the deluge. Several days after harvest. Some were coloring up but others just sat there green and hard. 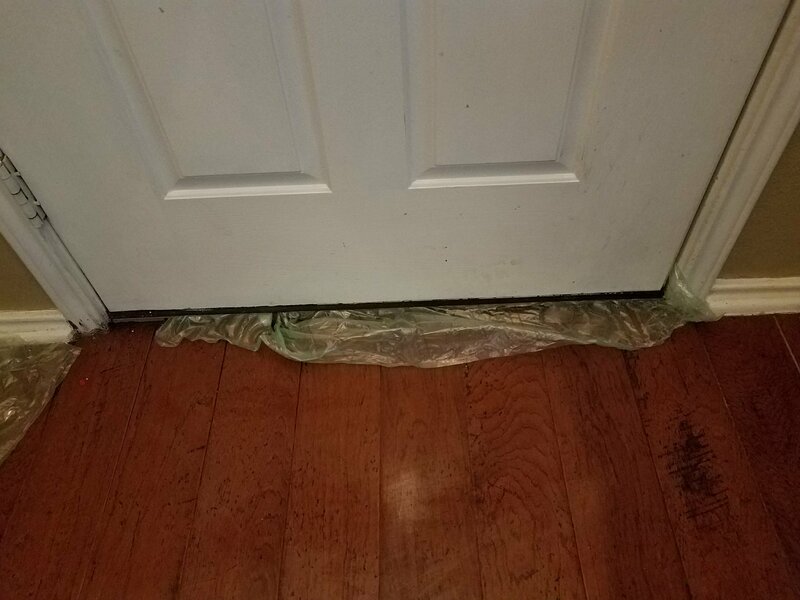 Harvey’s constant winds drove rainwater under our front door. We ended up putting plastic under the door and taping it closed, with painter’s tape, from the outside. I always pull my persimmon slightly early: just when they start to color, otherwise I lose them to birds and squirrels. The variety I have ripen over a long period of time, so I don’t usually have a glut and can enjoy a long harvest. However. When you are preparing for a hurricane (my husband and I met because of Katrina, so this wasn’t our first rodeo.) you have to consider fruit weight, high winds and the strength of the wood. My Saijo is a heavy fruiter. It is a reliable tree that I can always expect a good year from. This year was no different. My pear had 1 pear this year. My peach (that was a gift from my non-gardening husband) as usual, had nothing, but my persimmon was loaded down with fruit. Very green. Astringent. Super un-ripe fruit. I really didn’t have a choice. The fruit had to come down. Last year’s harvest. This tree is a hard worker in my garden! This is half of what I pulled, plus my large harvest of super green tomatoes. Both of these are fruit that will ripen off the plants, but usually: I only pull these after they start to color. So, it was a “wait and see” type of thing. Half of the persimmons I pulled. I was not very hopeful with these tomatoes. But I had to pull them or I’d have lost all of them. As the persimmon sat out on the counter I eventually noticed that they were getting soft and gelatinous (like ripe persimmon would) but the fruit’s skin was still green. I was thinking: I was going to have to throw them out. Before I trashed all of my fruit I decided to cut one of the soft ones open and check if there was any reason to keep them. To my surprise: despite the green skin, they were fully ripe inside and not astringent at all. Soft, but still green on the outside. What my fruit color should look like, beside the green skinned, but soft, fruit. Inside of the green skinned fruit. It is ripe, non astringent and the correct color. Ripe on the inside saijo. It was just as delicious as it is every year! I am so happy these did not have to be thrown out! 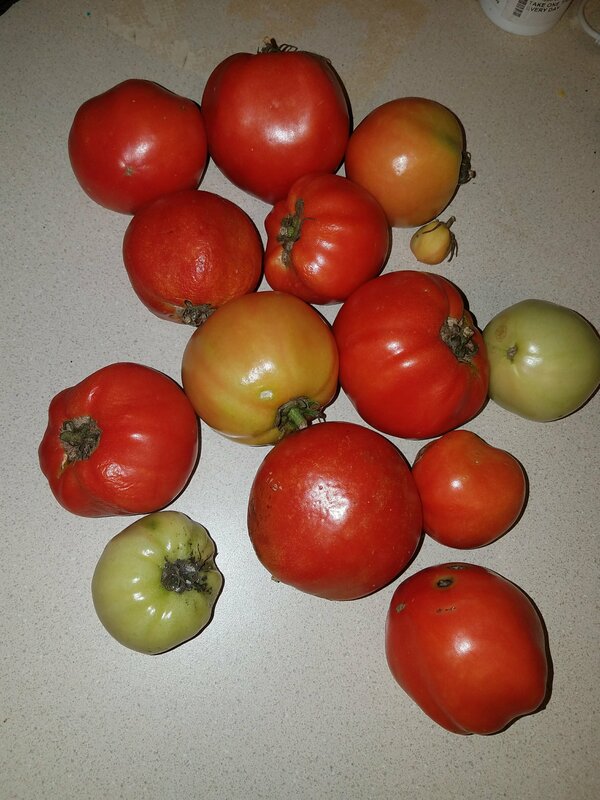 My tomatoes went from solid green (most had no blush at all) to fully ripe also. We were also extremely lucky that the hurricane did not do as much damage here as weather casters and our city expected. 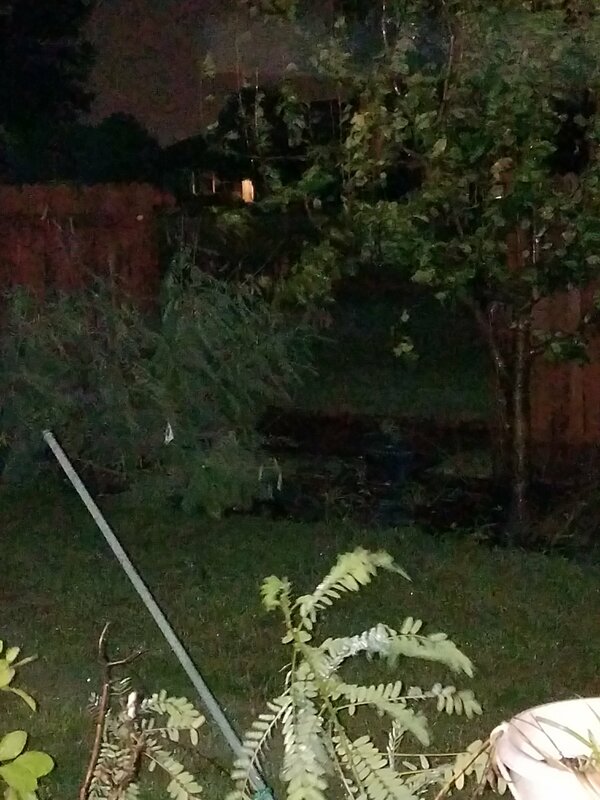 We got enough winds that they blew down three sections of our privacy fence, but no lasting damage. One of the sections of fence we lost during Harvey. Because none of my trees had a fruit load: I didn’t lose any branches. Like I said: San Antonio was very, very lucky! Our prayers are with our Houston neighbors, who were not as fortunate. Most of those super green tomatoes ripened too. So if you have a reason you MUST harvest persimmon and tomatoes early: know that for the most part, you will end up with ripe fruit. It’s OK to harvest very early, IF you have no other options. I can say that I wouldn’t do this if I had an option to leave them on the tree (I’ve noticed these persimmons can be slightly harder to digest when they weren’t ripened a bit more on the tree.) but if we have another emergency early harvest, I will be much more relaxed about the outcome! Not to mention that fruit left on the tree can become dangerous projectiles in that kind of storm.